It seems that Britain’s lager segment is struggling to retain its fizz, as it faces particularly strong competition from the rising popularity of ales and bitters, whose success has been fuelled by the craft beer boom. Indeed, new research from market intelligence agency Mintel reveals that 49% of Brits drank lager in 2015*, down from 54% in 2014**. Furthermore, Mintel research shows that consumers’ waning thirst for lager is affecting sales, with volume sales falling from 3.18 billion litres in 2014 to an estimated 3.15 billion litres in 2015. Overall, sales of lager have dropped by 8% over the past 5 years alone, down from 3.44 billion litres in 2010. Yet whilst Brits are losing their love of lager it seems ‘hop-portunity’ knocks at ale’s door, helped along by the rise of craft beer and styles such as IPAs (Indian pale ales) in particular. Brits are expected to have drank 913 million litres of ale and bitter in 2015, up from 895 million litres in 2014. Today, more than one quarter (27%) of Brits drink ale or bitter, whilst one in five (20%) drink any type of craft beer. What’s more, Mintel research indicates that lager’s falling fortunes are having a detrimental effect on overall sales of beer. Brits are estimated to have consumed 4.25 billion litres of beer in 2015, down from 4.27 billion litres in 2014. Meanwhile, value sales growth has slowed, rising only slightly from £16.61 billion in 2014, to an estimated £16.68 billion in 2015. There are however signs of growth in 2016 and Mintel forecasts value sales to reach £18.1 billion by 2020. Additionally, it seems that cost is having an effect on the nation’s appetite for beer, with as many as one fifth (20%) of UK beer drinkers saying they are not willing to pay more than £2.99 for a pint. While three in 10 (29%) beer drinkers overall are prepared to pay more than £4 per pint, it’s Londoners who are more willing to open their wallets, with 27% willing to pay over £4.50. “The steady rise in price over the past decade has given rise to notable consumer resistance in having to spend more on beer, particularly when it comes to breaking the £4, and even £5 barriers. Brands asking consumers to pay more for beer need to provide clear reasons for doing so, for example via packaging or branded glassware, as well as delivering a discernibly superior taste to cheaper mainstream alternatives.” Chris continues. Finally, Mintel research finds that for some consumers it’s not just the type of beer that’s important. Today, the top three glassware preferences for out of home beer drinkers are the nonic (27%), the tulip (16%) and the tankard (14%) style of beer glasses. Indeed, whilst once traditionally a favourite of the more mature male drinker, the tankard now garners the most interest among younger men. 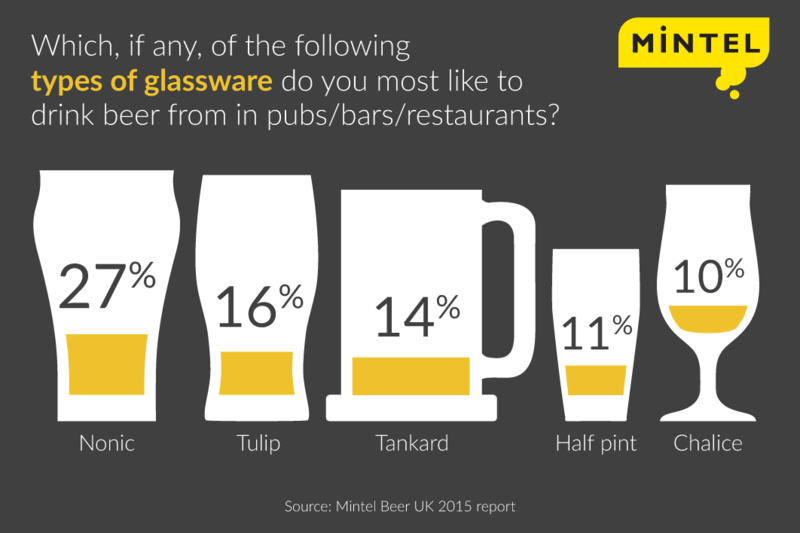 One quarter (26%) of 18-24 year old male out-of-home beer drinkers state that their favourite type of glassware to drink pints from is the tankard. The half pint, on the other hand, is more preferred by women, with one fifth (19%) of out-of-home female beer drinkers saying they most like to drink beer from this type of glass, compared to just 6% of men. “Tankards used to be a highly popular glass but fell out of favour in recent decades, largely due to their high production costs. However, there are significant advantages of this glass type, notably the handle which means that drinkers do not have to hold the body of the glass, warming their beer in the process. There are signs that the tankard is seeing a return in popularity as the favourite of younger male drinkers, most of whom were not drinking during the tankard’s previous period in the spotlight, buoyed by the craft ale movement.” Chris concludes. *In the six months to October 2015. ** In the six months to September 2014. Press review copies of the Beer UK 2015 report and interviews with Senior Drinks Analyst Chris Wisson are available on request from the press office.